Broccoli, Farm-Raised Uncooked Shrimp, Sugar Snap Peas, Water Chestnuts, Bean Sprouts, Red Bell Peppers. Seasoning: Salt, Dextrose, Black Pepper, Citric Acid, Onion Powder, Granulated Garlic, Celery. Heat 1 Tbsp. Oil (optional) in a large non-stick skillet or wok over high heat. Add desired level of seasoning and stir-fry for an additional minute. Serve immediately. BE CAREFUL when adding frozen foods to hot oil. We almost set our test kitchen on fire when the ice from the frozen shrimp caused the oil to pop and catch on fire. Point is, don’t heat the oil too much before adding the shrimps. Click here for tips on putting out kitchen grease fires. Who doesn’t like a good stir-fry dinner? It’s one of the easiest dishes to make – just chop up a bunch of veggies, throw them in a pan with some seasoning and toss! It’s also one of those recipes that doesn’t require you to go by the book – a little of this, a bit of that and you’re done. You like it savory? Add some soy sauce. You like it sweet? Add some teriyaki. Or get fancy with some sriracha sauce, peanut sauce, hoisin sauce or oyster sauce – the options are endless! 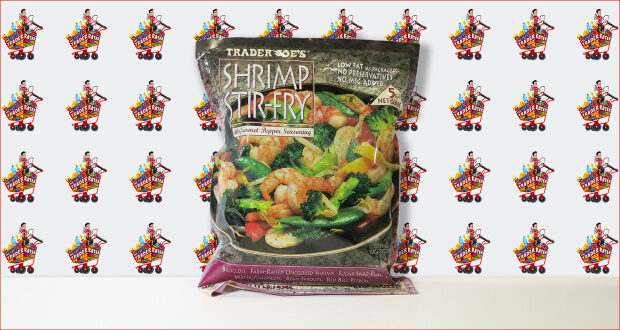 Consequently, because it’s such a quick dish, we were skeptical buying this frozen Shrimp Stir-Fry dish from TJ’s – though the “gourmet pepper seasoning” did pique our interest. Sadly, this was a mostly disappointing purchase. 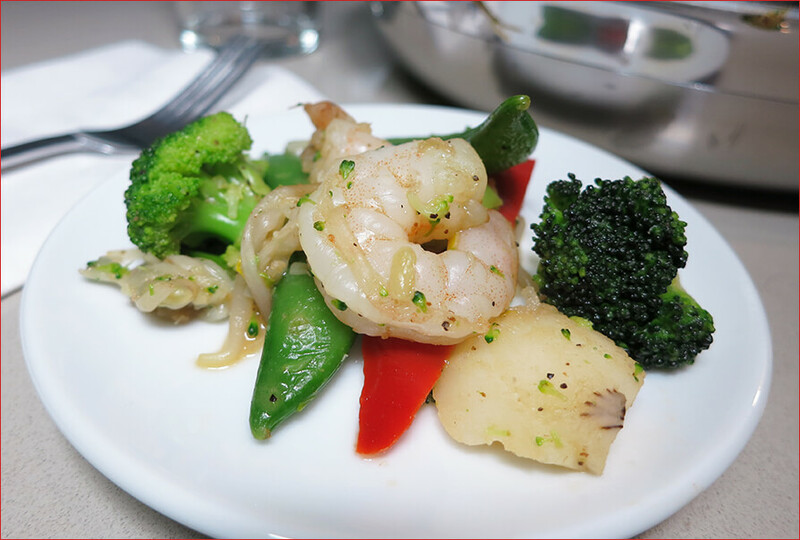 Aside from the fact what we almost set our kitchen on fire preparing the dish (see Cooking Notes above), we found the stir-fry to be light on shrimp and heavy on filler veggies like the stalk part of the broccoli and water chestnuts. The veggies also were limp and a bit waterlogged. On the plus side, the shrimps were tasty (though a bit salty). As for the gourmet seasoning? It’s basically a black pepper blend, and it’s kind of one dimensional. We would have preferred a sauce – even if it were a butter or soy sauce. Also, if you plan to make this into a main dish, you’ll need to add in some rice or pasta – the stir-fry can’t really stand on it’s own. All told, we won’t be buying this item again. You’re better buying a bag of frozen uncooked shrimp (which we find to be a great time- and money-saver compared to fresh shrimp) and making your own stir-fry from scratch. Point is, you’re not saving much time with this frozen stir-fry, and the sacrifice in flavor and quality isn’t worth the time saved. Summary : Though it was easy to prepare, we found this stir-fry to be light on shrimp and heavy on limp, filler veggies. The "gourmet pepper seasoning" was also a bit of a let down. You're better off making your own stir-fry.